Mexican tiles in "Cancun" style. 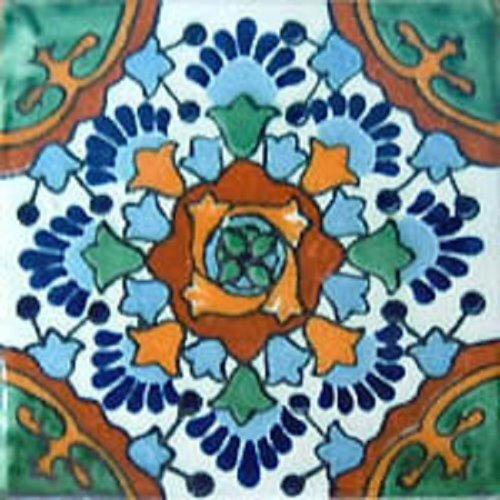 Moorish with green, light blue and terra cotta ceramic tile design over white background. Shipping from Mexico to the US and Canada is estimated for four weeks. Decided to upgrade my veranda facing a garden. The obvious choice when ceramic tiles were concerned were designs reflecting outdoor summer scenery. I found this moorish style ceramic tile design and right from the beginning I know that was it. They shipped my tiles from Mexico and the transit time to New York took almost four weeks. Still, I am satisfied from the tile quality and I loved free shipping offer. Mexican Tile "Moon and Stars"